So, you want to get into welding but you don’t know where to begin. Well no worries, because we’ve got your back. We’ll give you a few tips on how to choose, and where to find, a beginner’s welder. We’ll also talk about some popular welding techniques, and the advantages and disadvantages. In addition, we’ll cover how easy it is to learn each one, and what they are typically used for. Lastly, we’ll shoot some good machines your way, and group them according to the style they are intended for. By Gregory Sanders: This article has been updated to reflect the most accurate information regarding beginner-friendly welders available for those who are interested in learning how to weld. The best 6 available have changed, and information has been added to assist individuals in finding the best welders for beginners available on the market. The FAQ has also been updated. As we said earlier, MIG welders are easy to learn and operate machines and produce strong and clean welds. Here are the best MIG welders for the beginners. Miller Electric is one of the most prominent names in the welder industry. Miller machines are always at the top of their class, both in terms of power and durability. As a MIG/Flux core welder, Miller 120/240V welder is one of the best welders for a beginner. The item is very efficient at welding steel, particularly within 24 gauge to 3/8’’ mild, and 20 gauge to 3/8’’ stainless thickness range. The machine is not cheap, but its versatility and power more than make-up for it. If you want to learn to weld, Miller Electric will be one of the most forgiving machines you can find. The machine is also capable of effectively welding 18 gauge to 3/8’’ aluminum, making this device also fairly versatile. This is very favorable for a novice, as it allows you to experiment with different materials and different thicknesses. Another big name in the business is Hobart. The 5500559 is one of the most affordable welders on the market, making it a very good purchase for a novice. The welder is tuned to use common household current and has a range of 25-140 amps. At such a range, the machine is very versatile and is capable of welding anything from 24-gauge to ¼’’ steel. Some customers were complaining to the fact that the machine was manufactured offshore. With that, Hobart is capable of handling light household welding, as well as heavier, farm equipment-grade jobs. 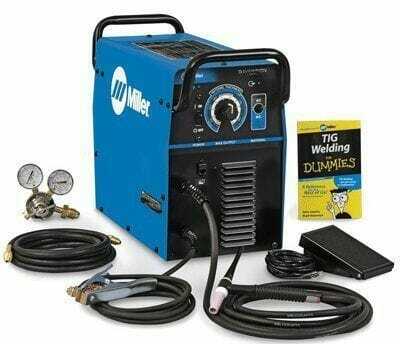 Besides versatility, the reason why this is such a great welder is because of its price - it’s a great entry-level deal. With this, Hobart is maybe an even better candidate for the ultimate beginner MIG welder. Check out our in-depth review of this welder by clicking here. Lastly, there is the Lincoln Electric 140C MIG welder. An $830 item, the 140C offers great power and ease of use. Just like Hobart, the 140C has an incredible range, 30-140 amps, making it very, very versatile. The welder is able to handle light household work as well as jobs on heavy farm machinery and can weld car frames with incredible ease. THE LE 140C is suited for US households and has a 120V input. The only thing is that the welder doesn’t have the best duty cycle rating; it’s rated at only 20%, though this can be explained by its awesome power. MIG welds are very strong and clean, and Lincoln doesn’t disappoint. TIG welders are more tuned to advanced users. These welders will be more difficult to master, because of the complex technique used. However, if you manage to master TIG, you can master anything. Plus, the machines usually come with a foot pedal that lets you gauge the power of the arc, so you can experiment with your welds. One of the more affordable models in general, the AHP AlphaTIG is an awesome thin-material-oriented welder. It’s capable of welding anything from ¼’’ aluminum to 3/8’’ mild steel, which is a pretty impressive range for a TIG welder. This, in turn, allows for a little more experimentation, which is, as the most experienced of welders would say, the best way to learn. Some users had a problem with AC tig. Allegedly some had problems with starting the arc so we suggest that you test AC tig rightaway. The welder is also capable of using both direct and alternate current, which, again, increases the machine’s versatility. This model from APH operates on both 110V and 220V, making it usable worldwide. It is also very light, and, thus, maneuverable, which is an overall great quality. You can read our in-depth review here. 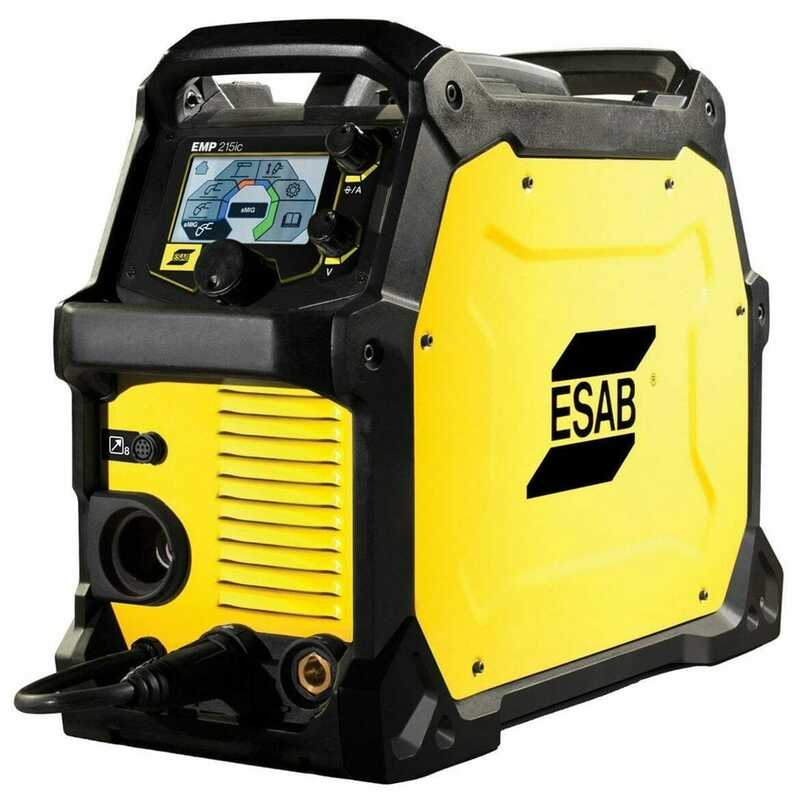 Our second TIG welder for beginners is the ESAB MiniArc welder. 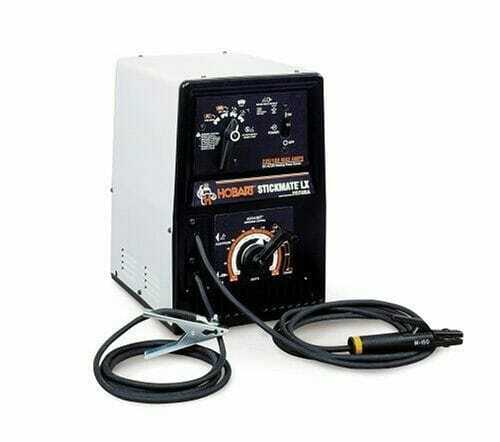 This is a very affordable and light welder, but it can still deliver quite a bit of power. This DC device can deliver a range of 5 to 160 amps. This makes the welder an excellent choice for very small and delicate welds. The welder is capable of operating both on a 115- and 230-volt input. However, the most impressive thing about this welder is the fixed hot start. This enables you to strike an arc without a moment’s thought. That being said, this makes the ESAB very good for anyone looking for a beginner level welder. Striking an arc can be quite a problem, and this nice addition makes ESAB very forgiving for novices. Lastly, another reason why you should definitely check this welder out is because it is so very light. At only 18 pounds, the welder is extremely portable. It even comes with a shoulder strap, so you can carry the welder wherever the action is. Last but not least is another Miller, but in another division. We’ve already established that Miller machines are the top dogs wherever they go, and this TIG welder is no exception. The machine has an AC/DC power source and has an amazing duty cycle, providing more power over an extended time period. The welder has an incredible range too, 10-165V, making it very efficient, powerful and gentle when needed. It also comes with a foot pedal as standard equipment. With this, the Miller product is one of the best TIG welders one can own. Price is rather high, MSRP at this moment is over $2000 making it a big investment. Lastly, there are the arc welders. Arc welding is a bit tougher to master, but, for those that do, there is nothing they can’t weld. Arc welders are workhorses, and they discard aesthetics for strong joints and effective fusing. For arc welders, we’ll have only two entries, but two excellent and affordable ones. The first is the Hobart Stickmate LX welder. At $680, this is one of the best machines on the market. The welder has a 235 amp AC and 160 DC output, meaning it can fuse cast iron like it’s nothing. Not only that, but the welder features the easy start technology, which makes it very easy to strike an arc, one of the vital skills you need to master arc welding. However, the problem with this machine is exactly that it’s so powerful. It’s definitely not designed for welding thin sheets of metal. This is, after all, an industrial-grade machine - but because of its affordability and easy start technology, it is also a beginner’s tool. However, if you feel like you can splurge, there is the Miller Maxstar 150 S welder. This is one of the most compact and most powerful stick welders, as well as most efficient. The welder operates either at 115V or on 230V. It also delivers extremely high amperage (almost 230 amps) for both AC and DC. It also delivers extremely high amperage (almost 230 amps) for both AC and DC. Of course, the machine features an automated hot start. However, Miller not only allows for an easier start, but it adapts the power so you won’t burn through the material. Arc welding can be a difficult task for beginners, this machine will help you with covering basics of arc welding. There are quite a few welding techniques in use today, but three are prevalent. The reason for this is because they are the most effective, and produce the best results. Those three are the arc/stick, MIG, and TIG. If you want to learn more about how each one of them compare to each other you can read our guide about the different welder types here. One of the most common and widely recognized welding styles is arc welding. For quite a few years, this style has been prevalent, and any and all welders use it. This welding style produces very strong welds and fuses the thickest metals with ease. It is also very stable, as the arc can easily work its way around rust and dirt. It is so stable, in fact, that it can work in very windy settings too, which lead to its high popularity. However, arc welding has its disadvantages. For starters, this kind of welding is only used for heavy-duty welding operations, with 1/16 inch metal and thicker. The style is somewhat difficult to learn because you have to change the rods often, you have to be very careful and maintain the arc without getting burned because it produces a lot of sparks. This style also requires cleaning and polishing the metal weld afterward. However, this is the only style capable of welding cast iron. For a beginner, there is no better way to start off than by using MIG welding machines. MIG is the easiest style to learn, while also being the quickest. Not only that, but MIG is incredibly clean, produces a very powerful joint, and is aesthetically favorable. MIG allows welding on thinner metals. However, MIG won’t do as well in windy conditions or on dirty and rusty metal. Luckily, there is flux-Cored welding, which is an iteration of MIG, but one that is much better at fusing dirty and rusty metals together. However, neither MIG nor Flux can weld cast iron. Last but not least, there is TIG welding. TIG is the cleanest and the most aesthetically pleasing welding style. It is perfect for thinner metals, is incredibly accurate and requires absolutely no cleaning afterward. The reason behind such accuracy is because TIG uses plasma to fuse the metal together. Argon is also used as a shielding gas to protect the weld from contamination. Now, the downside of TIG welding is because it is very slow. It might produce welds of pristine quality, is incredibly accurate, and, not to mention, aesthetic, but it will take you much more time to weld anything with it. On top of that, it takes a more than a few tries to get it right, and you will have to devote more time to mastering it. You can find more options that are great for beginner welders below. They are separated by the type of welder as well. We hope you found our article on three different welding styles and some representative beginner’s machines useful. As you saw, there is a pro and con to every style, and thus, every machine. So, the choice is yours.